BP agreed to plead guilty today to charges of manslaughter, environmental crimes, and lying to Congress in connection with the 2010 Deepwater Horizon drilling rig explosion, which killed 11 workers and sent as much as 200 million gallons of oil into the Gulf of Mexico. As part of a settlement with the U.S. Department of Justice, the company will pay $4.5 billion in what is the largest fine ever levied on a corporation in the United States. The charges against the company stem from BP engineers’ decision to ignore a critically important pressure test on the Macondo well structure that could have prevented the deadly blowout and explosion, and for misrepresenting the amount of oil leaking from the open well head after the mammoth drilling rig sank in nearly 5,000 feet of water. In a separate and unexpected set of charges, three BP managers were indicted for their roles in operating the rig and for misrepresenting facts to Congress, marking the first time that any senior BP personnel have been criminally charged for their roles in the disaster. 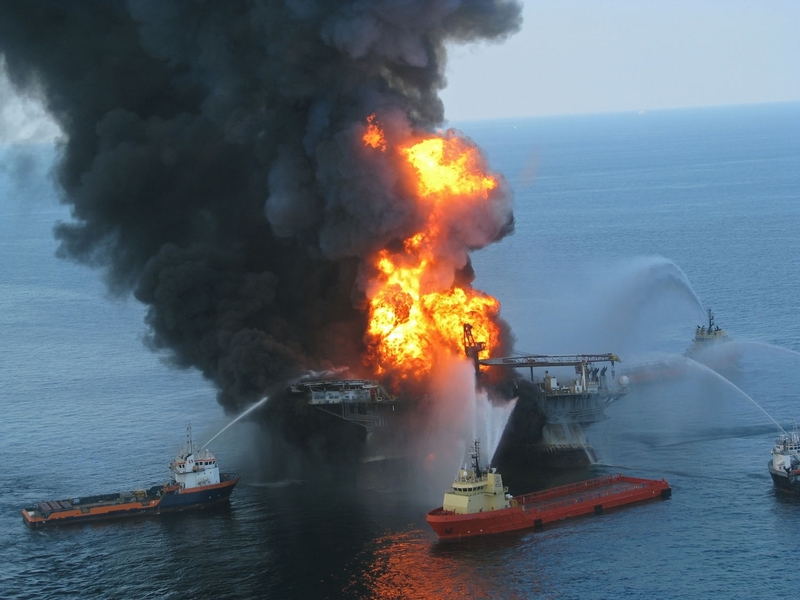 According to a statement issued by the Department of Justice, Robert Kaluza and Donald Vidrine u2014 the highest-ranking BP supervisors on board the Deepwater Horizon at the time of the accident u2014 have been charged with gross negligence in their oversight of the safety tests being conducted on the Macondo well the night of the disaster. Each man has been charged with 11 counts of manslaughter, 11 counts of involuntary manslaughter and one violation of the Clean Water Act. The manslaughter counts each carry a maximum penalty of up to 10 years in prison. In addition, BP’s former deputy incident commander and the company’s second-highest ranking person during the spill response, David Rainey, was charged with obstruction of Congress and making false statements to law enforcement officials. According to the Department of Justice’s statement, Rainey manipulated internal estimates to understate the amount of oil flowing from the well and withheld data that contradicted BP’s public estimate of 5,000 barrels of oil per day, even though the company’s internal calculations suggested a much higher amount. Rainey could face up to 10 years in prison. None of the men charged were available for comment, but lawyers for Kaluza and Vidrine told Bloomberg that their clients were innocent. The Justice Department previously filed charges against a former BP employee, engineer Kurt Mix, alleging that he destroyed evidence in the early days of the disaster, but today’s charges targeted higher-level employees with supervisory responsibility. As part of the corporate agreement, BP pleaded guilty to 11 felony counts of misconduct or neglect relating to the 11 deaths and one felony count of obstruction of Congress, according to a statement issued by the company. It also pleaded guilty to two misdemeanor counts, one under the Clean Water Act, the other under the Migratory Bird Treaty Act. The criminal settlement is separate from the $7.8 billion agreement BP reached with Gulf plaintiffs earlier this year. It also does not resolve the outstanding civil suits brought against the company by states and the federal government, which could cost the company as much as additional $22 billion. The charges for negligent interpretation of engineering tests on the ill-fated Macondo well set up the next battle for the company, as it prepares to defend against civil lawsuits and an assessment of fines under the Oil Pollution Control Act. A trial on that matter is expected to begin in February. It was not immediately clear whether today’s settlement would trigger dramatically higher environmental fines u2014 depending on the degree of negligence, BP could have to pay the government as much as $4,300 for each barrel of oil spilled in the Gulf. The settlement also opens the door to debarment proceedings against the company u2014 a possible ban on government contracts, including new leases, that is triggered by a criminal conviction. The Environmental Protection Agency has been evaluating BP for debarment since its deadly 2005 refinery explosion in Texas City, followed by an oil spill in Alaska in 2006. ProPublica reported extensively on the possibility of BP’s debarment in 2010. The agency had been awaiting a resolution in the Gulf matter before reaching a decision, sources tell ProPublica. There was no immediate comment from EPA officials about debarment following today’s announcement. In its statement, BP acknowledged the potential debarment consequences and said that it had not received word on whether debarment was still being considered. The largest portion of BP’s fine, almost $2.4 billion, will be paid to the National Fish & Wildlife Foundation over a period of five years, according to BP’s statement. The National Academy of Sciences will receive $350 million. The rest will go mostly to cover criminal penalties, with another $525 million to go to the Securities and Exchange Commission to settle securities claims. “We specifically structured this resolution to ensure that more than half of the proceeds directly benefit the Gulf Coast region so that residents can continue to recover and rebuild,” said Attorney General Eric Holder, in a statement. Abrahm Lustgarten, who reported on the BP oil spill for ProPublica, is the author of Run to Failure: BP and the Making of the Deepwater Horizon Disaster.